NASA astronaut Chris Cassidy describes how water leaked into the spacesuit of his crewmate Luca Parmitano during a spacewalk on July 16, 2013. This image is a still from a video recorded by Cassidy on July 30. The mysterious leak that cut a spacewalk short two weeks ago was apparently as frightening as it looked to those of us watching on NASA TV. On July 16, NASA astronaut Chris Cassidy and his European colleague Luca Parmitano hustled back inside the International Space Station after water began filling Parmitano's helmet, making it hard for the Italian astronaut to hear and see. The malfunction forced the astronauts to abort a planned 6.5-hour excursion after just 92 minutes. Both spacewalkers kept their cool, and everything turned out fine. But in a video describing the spacesuit water leak, Cassidy said the leak was a "scary situation" that could easily have been much worse. "The water — if it had continued to leak much more, it would have been very serious," Cassidy said in the NASA video, which was released today (July 30). 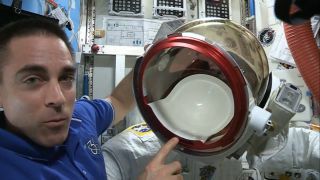 In the video, Cassidy walked viewers through the basics of the leak, explaining that coolant water somehow got into Parmitano's ventilation system and was then blown into his spacesuit helmet. Water droplets began building up behind a white piece of plastic at the back of Parmitano's helmet, Cassidy said. But they didn't stay trapped back there for long. "Once the water got big enough that it went all the way around and started coming outside the edge of the white plastic piece, then it saturated his communication cap, and sort of capillary flow just brought the water all around his head," Cassidy explained, using Parmitano's helmet as a visual aid. "He had water filled up in his ear cups, and it started to creep into his eyes and covered his nose," Cassidy added. Exactly why this happened remains unclear; engineers are still working to determine the cause of the leak. NASA has also appointed an expert panel to investigate the issue and help make sure it doesn't happen again. "The mishap investigation board will look more broadly at past operations and maintenance, quality assurance, aspects of flight control and other organizational factors," NASA officials wrote last week upon announcing the board, which will begin its work on Friday (Aug. 2). "The board's responsibility is to make observations and recommendations that can be applied to improve the safety of all of NASA's human spaceflight activities." Cassidy and Parmitano ventured outside the International Space Station on July 16 to perform a variety of repair and maintenance operations, and to help prepare the orbiting lab for the arrival of a new Russian module later this year. No spacewalks have been scheduled yet to finish the work the pair started that day. But there's no rush, Cassidy said. "The most important thing is that the suits are determined to be safe, so that whenever the next folks get outside everything works well for them," Cassidy said.